How can we assist others to become mature and to find inner peace unless we become more mature and peaceful ourselves? The disciplines of accumulating virtue and working for others can only be practiced successfully if they are founded on the ethical discipline of restraint from harmful actions. Bodhisattva conduct is extensively described in the Avatamsaka Sutra. Drawing on this Asanga wrote the Bodhisattva Stages,² which contains a chapter on the ethical discipline of Bodhisattvas. There are also various texts on the three sets of vows—the individual liberation vow, the Bodhisattva vow and the tantric vow—which describe how to safeguard them.³ The longer version of the Six Session Yoga⁴ lists the principal transgressions of the Bodhisattva vow and of the tantric vow. Chandragomin’s Twenty Verses on the Bodhisattva Vow⁵ is based on Asanga’s Bodhisattva Stages. The Bodhisattva vow is explained in terms of the preparation, the actual vow and the conclusion. It is vital first to understand what it is and to realize that we accumulate merit continuously, day and night, as long as we hold it. Those with a steadfast aspiration for enlightenment and a strong interest in the vow, who genuinely wish to hold it and are prepared to acknowledge and purify their faults, are ready to take the Bodhisattva vow. Through living by this code of ethical discipline, we follow the Bodhisattva ideal and conform to the actual condition of an authentic Bodhisattva.⁶ No matter how intelligent we are, if we fail to follow this code, we will never be true Bodhisattvas. It allows us to distinguish between what actions are and are not constructive. Understanding and remembering this, we then remain alert and vigilant. When we are about to do anything which is contrary to the vow, we conscientiously practice restraint. This basic procedure is a salient feature of the Buddhist approach and is not restricted to the ethical discipline of Bodhisattvas. It is not simply a question of whether or not we feel like doing something. The criterion is whether or not a specific action is appropriate. We try to refrain from actions which bring short-term happiness but long-term misery and to engage in those which bring long-term benefit, even though they may entail some immediate discomfort and difficulty. This may sound depressingly restrictive but in reality it is not. The Bodhisattva vow has certain special beneficial features. The first of these is that it is conferred by someone else. When we are tempted to transgress the vow, remembering the spiritual teacher from whom we received it arouses a healthy sense of embarrassment which acts as a restraint. The second feature is that the vow fosters a pure state of mind. Our sense of self-esteem as a Bodhisattva and our dedication to this pure state of mind prevent us from creating transgressions that result from copying others’ behavior or from trying to improve our personal reputation or livelihood. The third feature is that the vow can be restored. The fourth is that by respecting, cherishing and being mindful of it, our observance of the vow will not decline and we will not suffer from guilt or regret. To insure happiness and to avoid regret while holding the vow, we try not to damage it and quickly repair it when we do. The Bodhisattva vow is generally taken from a spiritual teacher but when this is not possible, it may be taken before Buddhas and Bodhisattvas whose presence we invoke. While it is possible to take individual liberation vows gradually, beginning with a one day vow, then the lay person’s vow, followed by the novice monk’s or nun’s vow and finally the vow of a fully ordained monk or nun, each entailing a greater commitment, there is no such progressive way of taking the Bodhisattva vow. The preparation is to train in the precepts associated with the aspiring altruistic intention. Some texts advise that we should then think about certain aspects of Bodhisattva discipline. This has been misinterpreted as a way of partially taking the Bodhisattva vow. The ethical discipline of Bodhisattvas falls into three categories: restraint from faulty action, accumulation of virtue and work for others.⁹ This division into three has been compared to a tripartite division of vows associated with the Lesser Vehicle: individual liberation vows which are intended to stop the faulty behavior that springs from the disturbing emotions; vows of concentration which are intended to prevent the disturbing emotions from manifesting, and vows of no contamination whose purpose is to stop completely the continuity of the disturbing emotions.¹⁰ It is, however, preferable to regard the three kinds of ethical discipline observed by Bodhisattvas as related to their two main tasks—of making themselves and others mature. Restraint from wrong-doing and a rich accumulation of virtue help us to become mature and equip us to do what is beneficial for others. The ethical discipline of working for others helps them to gain spiritual maturity. How can we assist others to become mature and to find inner peace unless we become more mature and peaceful ourselves? The disciplines of accumulating virtue and working for others can only be practiced successfully if they are founded on the ethical discipline of restraint from harmful actions. Anyone can practice this form of discipline. Those who hold any type of individual liberation vow practice such restraint by observing their lay person’s or ordained person’s vow. If we hold no vow of this kind, we practice restraint from ten harmful actions. These consist of three physical actions: killing, stealing and indulging in sexual misconduct. There are four harmful verbal activities: lying, using abusive or divisive language and wasting time on meaningless conversation. The three harmful mental activities in this context are covetousness, harmful thoughts and wrong views. Restraint from these ten activities is the basis for all Buddhist codes of conduct. Thus, even celestial beings and nagas who hold the Bodhisattva vow refrain from these ten harmful activities. A lack of interest in such restraint is a major obstacle to holding the Bodhisattva vow, and without the Bodhisattva vow we cannot hold the tantric vow. Apart from a few minor points, the code of ethical discipline for lay and ordained practitioners of tantra is very similar. It is a grave mistake to see tantric empowerment as a carte blanche for undisciplined and unethical behavior. Restraint from the ten harmful actions—even from just one of them—becomes a practice of those with the greatest capacity and a Bodhisattva activity when it is supported by the altruistic intention. The same restraint motivated by a wish for freedom from cyclic existence is a practice of those of intermediate capacity If motivated by the wish for a good rebirth, it is a practice of persons whose capacity is limited. If we refrain from these actions because we consider them unwholesome, happiness will result, but from a Buddhist point of view this is not an authentic spiritual practice because the motivation does not encompass concerns beyond our present life. From this we see that a significant qualitative difference emerges, depending on the state of mind with which things are done. New practitioners of the Bodhisattva vow focus on the development of restraint from harmful activity. Those on the later stages of the path of accumulation and on the path of preparation concentrate on the creation of virtue. 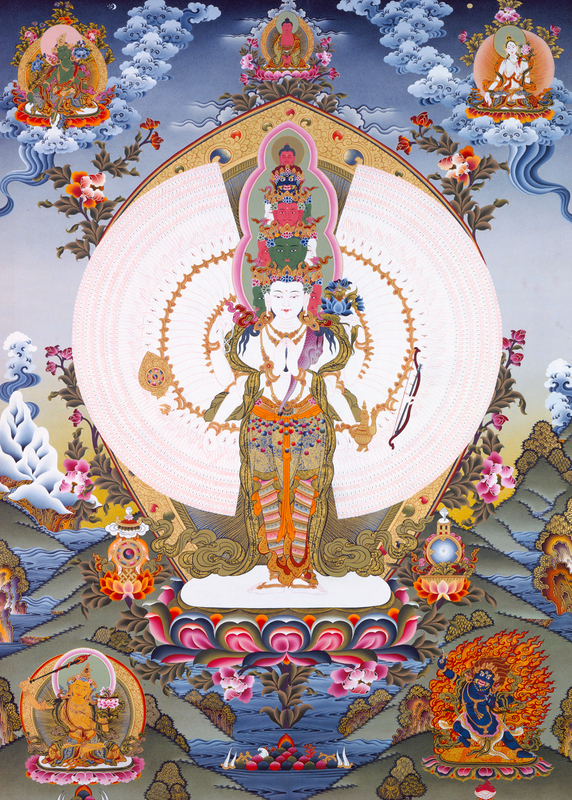 Exalted Bodhisattvas devote themselves to activities which will further the well-being of others. However, all Bodhisattvas practice all three kinds of ethical discipline. To attain enlightenment we must make the Buddha’s teachings ripen in our own mind stream, which is done through the creation of virtue. We must also help to make the teachings ripen and bear fruit in others, which is done by working for their well-being. The ethical discipline of accumulating virtue cannot be practiced without refraining from harmful behavior. Virtue is accumulated in order to attain enlightenment for the sake of others. The practice itself consists of creating physical, verbal or mental virtue with this intention. These are the three salient features of a Bodhisattva’s ethical discipline of creating virtue. A virtuous activity performed without the altruistic intention is not a Bodhisattva deed. In order to accumulate virtue Bodhisattvas train in eight main areas and we can emulate them. The first is to strengthen our practice of the three kinds of training—in ethical discipline, concentration and wisdom—and to develop the three kinds of understanding derived from hearing, thinking and meditating. This creates virtue. Based on restraint from harmful conduct, which is the basis of all ethical discipline, we gain understanding derived from listening to teaching on sutras and commentaries dealing with the Bodhisattva way of life.¹¹ This leads to understanding derived from thinking and gaining certainty about what we have learned. The next step is the development of calm abiding and of special insight, which respectively constitute the training in meditative stabilization and the training in wisdom. Ideally we should seek physical seclusion from a busy life and mental seclusion from disturbing emotions and from the constant flow of preoccupying thoughts. However, since contact with others can stimulate the growth of greater compassion and love, for Bodhisattvas mental seclusion from the disturbing emotions is more important than physical seclusion. The second principal way of creating virtue is in relation to special fields or sources of merit which include those who have helped us, such as our parents, those with excellent qualities, for instance our spiritual teachers, and those who arouse our compassion such as the sick. We accumulate virtue not just by giving them material gifts but also by showing them respect. We do this in relation to our parents and teachers by not behaving casually in their presence and by, for example, greeting and receiving them warmly, inquiring after their well-being, offering them a good place to sit, rising to our feet when they enter a room and seeing them out when they leave. If we catch sight of them in the distance, even if they haven’t noticed us, respectful behavior is appropriate. All living beings should naturally be treated with respect, but our parents are singled out for mention here because they have given us our body. Our spiritual teachers are mentioned because they show us the way to happiness. Nursing the sick, providing them with medicines and cheering them up, comforting and supporting those who are grief-stricken, and, in whatever ways we can, helping those who suffer are actions for which there are ample opportunities. However, they only become a Bodhisattva’s creation of virtue if they are done with the altruistic intention to attain enlightenment for all living beings. The third way of creating virtue is by developing a liking for good qualities and for those who have them. We remind ourselves to thank and praise those who teach us correctly about the true nature of reality and to appreciate and praise those who possess good qualities. When we hear others speak well of them, we should add our own praise without envy. Through this we can create as much virtue as those who possess the praiseworthy qualities. Training ourselves to rejoice in others’ admirable accomplishments and abilities is an essential Bodhisattva activity. The divine (Sambhogakāya) form of the 1000-Armed Chenresig (Avalokiteśvara), who is seen as the embodiment of all the infinite Buddhas’ compassionate wisdom. The fourth source of virtue is patience. When we are harmed, two approaches are helpful. One is to think that through our own past actions we have set ourselves up as the target for this harm. Our present experience is the fruition of those actions. The other approach is to remember that the person who is inflicting the harm is dominated by the demon of disturbing emotions and is out of control. These emotions are not an integral part of their nature but something that temporarily overwhelms them and from which they can become free. For Bodhisattvas neither anger nor the wish for revenge are acceptable responses. On the contrary, they respond with love and the compassionate wish to help those who are harmful to throw off the burden of these disturbing emotions. Even if we are not yet Bodhisattvas, thinking in these ways can help us to remain calm in potentially explosive situations. The sixth way to create merit is by making material offerings and offerings of our practice to the Three Jewels. There is never any shortage of things to offer, but what is lacking is our faith and willingness. We can offer the unowned natural beauty of rivers, lakes, forests, mountains, wild flowers and the sea as well as the creations of our imagination, but if we are in a position to make material offerings, we should not be too miserly to do so. It is said that the offerings must “not be bad,” meaning they should not have been acquired dishonestly nor should they be made with any ulterior motive. They should be “extensive,” which means they should be generous and not niggardly, and the state of mind with which they are made should encompass the good of all sentient beings. Living up the valley from Sera Monastery in central Tibet was Geshe Choktse, who had very few possessions. When he went to visit his spiritual master, Kyabje Trijang Dorje Chang, the junior tutor of His Holiness the fourteenth Dalai Lama, he would pick up the apricots lying on the ground under the fruit trees next to his home if he had nothing better to offer. Once his benefactor gave him a warm meditation cloak. Since it was brand-new, he felt very happy and took it as an offering to Kyabje Trijang Rinpoche but Kyabje Rinpoche, knowing how poor he was, refused to accept it. Determined to offer it anyway, Gen Choktse put it over the mounting-block outside Kyabje Rinpoche’s house. I remember attending a teaching on Offerings to the Spiritual Teacher¹⁴ given by Kyabje Trijang Rinpoche at Sera Monastery in South India. When explaining a particularly complex tantric practice, Kyabje Rinpoche remembered how Geshe Choktse had once confided that no matter how long he remained in meditative equipoise on emptiness, he only ever experienced bliss, whereas he had found this particular practice difficult. Geshe Choktse died in Wölka Chöling,¹⁵ where Je Tsongkhapa had spent several years practicing very intensively. The seventh way of creating virtue is by conscientiously directing our physical, verbal and mental activities away from non-virtue to virtue, such as the practice of the six perfections. And to create virtue in the eighth way the Bodhisattva is advised to train in all aspects of the path of accumulation. This means concentrating on constructive activities with mindfulness and mental alertness, which is impossible unless one can control the senses by not reacting with attachment to attractive objects, with aversion to unattractive objects and with confusion to neutral objects. Our intake of food should be moderate, neither too little nor too much, since both extremes are an obstacle to virtuous conduct. Shantideva recommends that we should leave a third of our stomach empty. In addition to practicing during the day, the night should be divided into three parts and we should sleep only during the middle part. Much of our life is spent sleeping but this time need not be wasted because by falling asleep in a positive state of mind, the sleep which follows becomes a source of virtue. We need good companions to encourage us and an inspiring spiritual teacher to guide us. If we cannot find such helpful companions and live far away from our spiritual teacher, we must be our own companion and mentor by recognizing faulty actions, remembering their disadvantages, applying counteractions and purifying them in front of representations of enlightened body, speech and mind or in the presence of Buddhas and Bodhisattvas whom we imagine before us. Bodhisattvas on the great stage of the path of accumulation have constant access to the supreme emanation bodies of enlightened beings. Buddhas and Bodhisattvas are all around us but in ordinary form. When we behave negatively towards our spiritual companions, instead of hiding such actions, we should openly confess our wrong-doing and apologize. At present we tend to react defensively to any criticism of our actions and take an instant and intense dislike to the person who voiced it. Since the individual liberation vow serves as a basis for the Bodhisattva vow and the tantric vow, it is a great mistake to see it as belonging exclusively to the Hinayana vehicle and as an obstacle to Mahayana practice. If Bodhisattvas who are monks or nuns hanker for past, present or future objects of desire and wish for what they have given up, their act of taking ordination becomes senseless. For lay Bodhisattvas non-attachment to past and present objects is not as important as non-attachment to future ones. This doesn’t just mean a lack of attachment to the latest gadgetry. The creation of virtue now out of attachment to the sensual life one hopes to enjoy in future as a celestial being is a failure to observe the individual liberation vow, which is based upon a wish for freedom from all states of cyclic existence. In brief, Bodhisattvas make effort to create fresh virtue by enhancing their practice of ethical discipline, concentration and wisdom and by developing the three kinds of understanding derived from hearing, thinking about and meditating on the teachings. They protect and safeguard their ethical discipline, particularly through patience, since virtue is undermined by anger. They enhance and strengthen it by rejoicing, dedicating their virtue to become a cause for others’ well-being, and by making stainless prayers of aspiration. With the resolve to emulate them, we can begin training ourselves now to create virtue as they do. The first of these is to help others by assisting them in their activities, such as farming and business, provided this does not entail negativity. For instance a Bodhisattva may advise those who are trying to accumulate wealth and those who already have wealth on how to safeguard it, prevent it from declining, and on how to use it well. Conflict mediation is included in the assistance Bodhisattvas offer. They give help and friendship to the sick by caring for them or by making provision for their treatment and they assist travelers who are suffering from physical or mental problems to reach their destination. They learn to communicate with the deaf and teach them what is and is not constructive. These days of course there are motorized wheelchairs and many devices to help the disabled, but in the past the Bodhisattva might have had to carry the sick or disabled person. The second way of working for others is to advise those who are confused about what means to employ For instance, this might involve helping those who are suffering as a result of negative actions to understand what gives rise to suffering and what acts as a cause for happiness. On the other hand it may quite simply be a matter of giving them practical and clear advice on mundane matters and suggesting steps by which to proceed. To do this the Bodhisattva must be able to understand and assess situations correctly. The third way by which Bodhisattvas work for others is by returning the help they have received in the past. Although we are not aware of it, all living beings have helped us in countless ways. Bodhisattvas behave in a friendly and welcoming manner to those whom they encounter, whether they know them or not. Even unasked, they provide or guide them to accommodation and food and do what they can to look after their needs. The fourth way is to assist and protect those in fear. We all have rational justified fears but we also have many irrational fears. A Bodhisattva provides protection from danger and tries to alleviate fear wherever possible. Although we may not find ourselves launching dramatic rescue operations to save people’s lives, there are many opportunities to save creatures from being burned, drowned, carried off by the wind or crushed by earth. The fifth way is to console those in grief. People suffer bereavement when parted from parents, partners, children or spiritual teachers either through distance or death. Since it is rare to find affectionate friends who can be trusted, their loss is hard to bear. The death of a dog or cat is often a great loss to someone living alone. People also grieve when they lose their wealth or property through natural calamities, war or theft. Some lose it because they are careless, others by risking everything they have in the hope of gaining more. The Bodhisattva skillfully consoles and encourages the bereaved person to think about the teachings, particularly the impermanent nature of living beings, relationships and possessions. Often helping people to express their grief and listening attentively gives them consolation. The sixth way is to help those in need. A Bodhisattva tries to provide whatever is required, such as food or shelter, companionship, good clothes and jewelry for those who feel they must keep up appearances, and even perfume and flowers for those who smell bad! The seventh is to act as a support to those who are searching for someone on whom they can rely. Without self-interest, Bodhisattvas look after those who seek a spiritual teacher, providing them with material and spiritual sustenance, by, for instance, giving them instruction on how to develop mental stability. The eighth is to help others according to their disposition and way of thinking. Bodhisattvas must understand the attitudes, aspirations and abilities of those they wish to help. Understanding their attitudes includes discerning which disturbing emotions predominate, whether the person tends towards wholesome or unwholesome activities, and to what extent their love and compassion have developed. Undeistanding their aspirations involves awareness of what people hope to accomplish and whether they wish to attain enlightenment, personal liberation, or a high rebirth. Their underlying disposition determines their capacity This decides the nature of their practice which in turn determines the kind of result they can attain. For their help to be effective Bodhi- sattvas must be sensitive to all aspects of the other person. What if our help makes that person unhappy? We should continue if it is useful in steering him or her away from harmful activities and if it will be of ultimate benefit. If our approach proves ineffective, we should try a new approach more in keeping with that person’s temperament. When what we do is successful but our actions upset a third person, there is no need to stop, provided our intentions are good. Many possible responses and situations are considered in this way. For example, it is recommended that people who are a “ball of anger” be left to cool down before we even try anything as positive as praising or apologizing to them. Since helping others and discussing matters that are important to them demands a certain degree of intimacy, we are encouraged not to cut ourselves off from others but to create friendships. On the other hand if we are too intrusive, our presence may stop them doing things they consider essential and they may come to resent us. We must therefore become skillful in sustaining relationships. In our enthusiasm to help we may be too trusting, which is a mistake when we do not know the other person well. People are not always what they appear to be. We should encourage others to do positive things within their capacity and discourage them from doing what is over-ambitious. The ninth way is to support and encourage those engaged in excellent enterprises, such as cultivating faith, observing ethical discipline, studying the teachings, practicing generosity and developing wisdom. Ethical discipline and generosity are responsible for a good rebirth and sufficient resources. Wisdom is necessary for the attainment of liberation, since only it allows us to overcome the basic confusion which binds us to cyclic existence. However, wisdom comes only through listening to and studying the teachings, which one will not do unless one has interest and conviction in them. The tenth way is to correct those who are not doing what they should and doing what they should not. It is misguided to tolerate and ignore their actions. When parents and teachers try to address such problems they often get upset, but a Bodhisattva remains clear and calm. Whereas we can begin to practice these ten ways of helping others, we cannot perform the eleventh, the accomplishment of miraculous feats, until we have developed certain powers based on a high degree of meditative stabilization and not the less reliable kind of powers attained through the combination of substance and mantra. The question arises as to whether there is a difference between compassion and pity. Compassion is always a positive emotion, whereas pity may be accompanied by feelings of superiority and condescension. We must guard against any attitude which devalues others and give importance to recognizing our own rather than others’ faults. When others act in a negative way, we must try not to get upset nor to respond with anger, hostility or hatred. Instead, realizing that their behavior and the negative tendencies which underlie it are something temporary, we should try to help others get rid of them. ¹ The Mahayana or Great Vehicle (theg pa chen po) consists of the causal Perfection Vehicle (rgyu pha rol tu chin pa'i theg pa) and the resultant Secret Mantra Vehicle ('bras bu gsang sngags kyi theg pa). The Perfection Vehicle is the body of practices described in the Mahayana sutras by which a Bodhisattva creates the great stores of merit and insight necessary for enlightenment over three incalculably long aeons. The Secret Mantra Vehicle is the body of practices described in the tantras through which enlightenment can be attained in one short lifetime. These practices are suitable for practitioners of the very highest caliber. By virtue of simulating the desired result, enlightenment, through tantric practice, the result actually comes into being. ² Asanga’s Bodhisattva Stages (Yogacaryābhūmaubodhisattvabhūmi, rNal 'byor spyod pa'i sa las byang chub sems dpa'i sa, P5538, Vol. 110) explains the paths of the Great Vehicle while its companion volume, the Hearer Stages (Śrāvakabūhmi, Nyan sa, P5537, Vol. 110), explains the paths of practice of the Lesser Vehicle. ³ One of these is Sakya Pandita Kunga Gyeltsen’s (Sa skya pandita Kun dga' rgyal mtshan, 1182-1251) Analysis of the Three Vows (sDom pa gsum gyi rab tu dbye pa'i bstan bcos). Another is the String of Brilliant Jewels: Instructions on the Individual Liberation, the Bodhisattva and the Tantric Vows (So thar byang sems gsang sngag gsum gyi sdom pa'i bslab bya nor bu'i 'od 'phreng) by Tsenshap Tsewang Samdrup (mTshan zhabs Tshe dbang bsam 'grub), debating tutor to the tenth Dalai Lama, Tsultrim Gyatso (Tshul khrims rgya mtsho, 1816-1837). Also see Buddhist Ethics, translated into English and edited by the International Translation Committee founded by the V.V. Kalu Rinpoche (Ithaca: Snow Lion Publications, 1998), which contains the fifth book of Jamgön Kongtrul Lodrö Taye’s (Kong sprul Bio gros mtha' yas, 1813-1899) Infinite Ocean of Knowledge (Shes bya mtha' yas pa'i rgya mtsho). ⁴ There are different versions of the Six Session Guru Yoga (Thun drug bla ma'i rnal 'byor). A long and a short version were written by Pabongka Rinpoche (Pha bong kha rin po ehe, Byams pa bstan'dzin 'phrin las rgya mtsho, 1878-1941), the eminent Gelugpa master and the foremost spiritual teacher of His Holiness the fourteenth Dalai Lama’s junior tutor, Kyabje Trijang Rinpoche. The long form of the Six Session Guru Yoga lists the primary transgressions of the Bodhisattva vow and of the tantric vow. By reciting the text we remind ourselves of these and of the various pledges associated with the practice of tantra. This allows us to ascertain whether any transgressions of these pledges have occurred, so that we can take steps to purify them. According to the Indestructible Peak Tantra (Vajraśikharamahāguhyayoga tantra, gSang ba rnal 'byor chen po'i rgyud rdo rje rtse mo, P113, Vol. 5), certain pledges relating to the five Buddha families (rgyal ba rigs Inga) should be honored six times in twenty-four hours and failure to do so creates a serious fault. By performing the Six Session Yoga one keeps these pledges. This is an important aspect of how Bodhisattva conduct is practiced in the context of secret mantra. ⁵ Twenty Verses on the Bodhisattva Vow (Bodhisattvasaṃvaraviṃśaka, Byang chub sems dpa'i sdom pa nyi shu pa, P5582. Vol. 114) explains the eighteen main and forty-six secondary infractions of the Bodhisattva vow. See Candragomin’s Twenty Verses on the Bodhisattva Vow, translated by Mark Tatz (Dharamsala: Library of Tibetan Works and Archives, 1982). This also contains a commentary, Byang chub sems dpa'i sdom pa gsal bar ston pa shlo ka nyi shu pa'i mam par bshad pa, by Dragpa Gyaltsen (Grags pa rgyal mtshan, 1147-1216), one of the founders of the Sakya school. ⁶ The Tibetan term for ethical discipline is tshul khrims. By observing this code of conduct (khrims) we live in a way that accords with the actual condition (gnas tshul) of a true Bodhisattva. ⁷ There are eight kinds of individual liberation vow (so sor thar pa'i sdom pa rigs brgyad). The individual liberation vow (so thar gyi sdom pa) is so called because observing it enables an individual to attain liberation. It focuses primarily on the maintenance of pure physical and verbal conduct. Different forms of this vow are taken by lay and ordained people. The “vow of one who remains nearer” (bsnyen gnas kyi sdom pa), through which one draws closer to liberation, is taken for only twenty-four hours at a time and is therefore not considered equal to the others as a basis for the Bodhisattva vow. It consists of restraint from (1) killing, (2) stealing, (3) lying and (4) sexual activity. One may not use (5) high or fancy seats, (6) intoxicants, (7) eat after midday, (8) wear garlands, jewelry or perfume, make music, dance or sing. This vow is taken by lay persons. The second and third kinds of individual liberation vow, which are also taken by lay persons, are the “vow of one close to virtue” (dge bsnyen gyi sdom pa) for men and for women. Virtue here refers to nirvana. Both men and women vow to observe restraint from (1) killing, (2) stealing, (3) lying and (4) sexual misconduct. They also promise to refrain from the use of intoxicants. The remaining kinds of individual liberation vow are taken by those who leave family life behind (rab tu byung ba). They must rely on an abbot, give up the signs of lay life, adopt the signs of ordained life and insure that they do not deviate from these three forms of conduct. The fourth and fifth kinds are “vows of those entering the path to virtue” (dge tshul gyi sdom pa), often referred to as novice monks’ and nuns’ vows. They involve restraint from (1) killing, (2) stealing, (3) lying and (4) sexual activity, from (5) making music, dancing or singing, (6) wearing garlands, jewelry or perfume, (7) accepting silver or gold with the intention of keeping them, (8) taking food after midday, (9) using ornate seats or (10) high seats. The sixth is the “vow of a female trainee in virtue” (dge slob ma'i sdom pa). In preparation for becoming a fully ordained nun she must hold the vow of a novice nun and in addition practice restraint from twelve activities for two years. She must not (1) travel unless accompanied by someone who observes a similar code of discipline, (2) swim naked across a big river to reach the other side, (3) touch a man, (4) sit on the same seat as a man, (5) act as a matchmaker, (6) hide the transgressions of a female friend, (7) own gold or other valuables, (8) shave her pubic hair, (9) eat what has not been given to her, (10) eat food she has saved, (11) cut green grass and dispose of bodily excretions indiscriminately, or (12) dig the earth. The seventh and eighth kinds are the “vows of those who strive for virtue” (dge slong gi sdotn pa and dge slong ma'i sdom pa). A fully ordained nun must refrain from three hundred and sixty-four activities; a fully ordained monk from two hundred and fifty-three. ⁸ Those with the Bodhisattva vow exist in the lower realms and in the realms of celestial beings and humans. Celestial beings of the desire realm and humans can newly acquire the Bodhisattva vow, whereas those in the lower realms and in the form and formless realms can only hold the Bodhisattva vow which they received in a former lifetime and did not relinquish. ⁹ The ethical discipline of restraint from faulty action: nye spyod sdom pa'i tshul khrims; the ethical discipline of accumulating virtue: dge ba'i chos sdud pa'i tshul khrims; the ethical discipline of working for the good of sentient beings: sems can don byed kyi tshul khrims. ¹⁰ Individual liberation vows intended to curb the actions which result from the disturbing emotions: nyon mongs rtse 'jil ba'i so thar gyi sdom pa; the vow of concentration which temporarily prevents [the disturbing emotions from] arising even though the conditions [for this] are present: rkyen yod kyang re zhig mi Idang ba'i bsam gtan gyi sdom pa; the vow of non-contamination which severs the continuity [of the disturbing emotions]: rgyun good pa'i zag med kyi sdom pa.
¹¹ The category of teachings that deals with the conduct of Bodhisattvas (byang chub sems dpa'i sde snod) in general refers to all literature explaining the practices of Bodhisattvas and in particular to the whole Avatamsaka Sutra, as mentioned earlier. The twelfth chapter of the Heap of Jewels Sutra (Mahāratnakūṭasūtra, dKon mchog brtsegs pa'i mdo, P760, Vols. 22-24) is entitled Bodhisattvapiṭaka, Byang chub sems dpa'i sde snod. ¹² While all prayers of dedication (sngo ba) are prayers of aspiration (smon lam) the converse is not true. When making a dedication we need something to dedicate, such as the positive energy we have created by performing a certain practice or showing kindness to others. We dedicate this to act as a cause for others’ temporary and ultimate well-being. ¹³ The Sutra on the Ten Stages (Daśabhūmikasūtra, mDo sde sa bcu pa, P761.31, Vol. 25) forms part of the Avatamsaka Sutra. Of all motherly living beings ripen now on me. May all living creatures be possessed of happiness. ¹⁵ Wölka ('Ol kha) is situated in the Loka (lHo kha) region of central Tibet. ¹⁶ The six different forms of super-knowledge or higher perception are as follows: knowledge of miraculous feats (rdzu 'phrul gyi mngon shes) allows Bodhisattvas to reach different worlds in order to find those with whom they have a particularly strong karmic connection. Through knowledge of others’ minds (gzhan sems shes pa'i mngon shes) they are able to discern the different abilities, inclinations, interests and dispositions of those they wish to help, so that what they do will be entirely appropriate. With the divine ear (lha'i rna ba'i mngon shes), a form of clairaudience, they can hear what is going on in other worlds and pure lands. Knowledge of past places (sngon gyi gnas rjes su dran pa'i mngon shes) permits them to remember the spiritual teachers, people and practices with which they have had a close connection in the past. Clairvoyance, the divine eye (lha'i mig gi mngon shes), gives them the power to discern others’ feelings of happiness or unhappiness. Knowing the end of contamination (zag pa zad pa'i mngon shes) is a personal understanding gained through meditation and higher perception of the paths of practice which lead to liberation, and of how to communicate this understanding to others. ¹⁷ The eleven ways in which Bodhisattvas work for the good of others is to act as a friend to those who need one (grogs bya dgos pa), to give advice to those who are confused (thabs la rmongs pa), to help those who need help (phan 'dogs pa), to protect those who are overwhelmed by fear ('jigs pas nyen pa), to comfort those who are tormented by grief (mya ngan gyi gzir ba), providing for those who lack things (yo by ad kyi phongs pa), acting as a mentor to those who wish to meet a spiritual teacher (gnas 'cha' bar 'dod pa), and as a companion to those who seek someone like-minded (bio mthun par 'dod pa), praising those who are engaged in what is correct (yang dag par zhugs pa), admonishing those who are engaged in what is wrong (log par zhugs pa) and subduing those for whom it is appropriate through magical feats (rdzu 'phrul gyis gdul bar bya ba). Geshe Sonam Rinchen was born in 1933 at Dhargyey, in the Trehor Kham region of Eastern Tibet. At the age of thirteen he decided to become a monk and entered Dhargyey Monastery, where he excelled in his studies and in debate. When he was nineteen, he made the two and a half month journey on foot to Central Tibet in order to enter Sera Je College of Sera Monastery. He became a fully ordained monk and remained there for the next six years until his studies were interrupted by the Chinese invasion of Tibet in 1959, which forced him into exile in India. For the following nine years he lived with many other monks under extremely harsh conditions in Buxaduar, West Bengal, in what had previously been a British internment camp. There he continued to study intensively with eminent teachers who had also escaped from Tibet. In 1967 he entered what is now the Central University of Tibetan Studies in Sarnath and stayed there until 1976, obtaining the degrees of Shastri and Acharya with honours. In 1980 he took the public examinations for the monastic title of Geshe. This required many public debates before the assembled monks of Sera, Drepung and Ganden, established in exile in the south Indian state of Karnataka. He received the highest qualification, that of Geshe Lharampa. In the winter of 1982/83 he spent three months in Japan at the invitation of Nagoya University and was also a guest lecturer at Kyoto Buddhist University. In 1986 he was invited on a five month teaching tour of Australia. In 1992 Geshe Sonam Rinchen made a three month tour of Britain and Ireland, undertaken with the special blessing of His Holiness the Dalai Lama. This tour focused on conveying the essence of the Buddha’s teaching to spiritual practitioners of other traditions with special emphasis on dialogue regarding the meaning of authentic spiritual practice. In 1994 Geshe Sonam Rinchen undertook a three month teaching tour of Switzerland. During this period, he also taught in Hamburg, Germany. In 1999 he travelled to New Zealand to lead ‘Prayers for Peace and Compassion at the Dawn of the New Millennium’ and taught extensively on the North and South Islands. In 2001 and 2003 he taught in Australia and between 2001 and 2011 he made four further teaching tours of New Zealand. Geshe Sonam Rinchen published ten books in collaboration with his translator Ruth Sonam on such subjects as Aryadeva’s Four Hundred on the Middle Way, The Heart Sutra, The Bodhisattva Vow, The Six Perfections, Buddha Nature and Atisha’s Lamp for the Path to Enlightenment. Except for public holidays and a two and a half to three month break each winter, he taught daily at the Library of Tibetan Works & Archives for thirty-four years with unflagging enthusiasm and an intense wish to communicate the essence of the Buddha’s message, as well as that of the great Buddhist masters of India and Tibet, with particular emphasis on classical works by the Indian masters of the Nalanda tradition. Over the years many thousands of students attended his classes. He taught with warmth, compassion and a complete command of his material. He also had the great skill of making any question asked an opportunity for a profound answer that satisfied the questioner and enriched everyone else. He never refused to see students privately and treated them all with the greatest courtesy, giving many of them advice that profoundly influenced their lives. 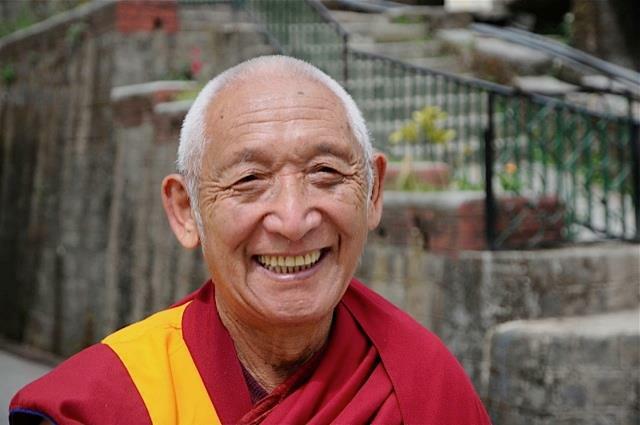 Venerable Geshe Sonam Rinchen passed away in Dharamsala on 5th September 2013. He was eighty years old and had been suffering from stomach cancer. Remarkably, he experienced no pain throughout his illness and because he did not require any drugs, he passed away peacefully, listening to prayers and in a completely lucid state of mind. He was cremated on the grounds of the Library of Tibetan Works & Archives, where he had taught from 1978 until 2012. Chapter VII of The Bodhisattva Vow, by Geshe Sonam Rinchen, translated and edited by Ruth Sonam, Snow Lion (2000) / Shambala Publications, pp. 99–113. Ruth Sonam was born and grew up in Ireland and graduated from Oxford University with an M.A. in Modern Languages. She began studying with Geshe Sonam Rinchen in 1978 and worked as his interpreter from 1983–2013. Offered with kind permission from Ruth Sonam. ¹ The books published by Snow Lion, which no longer exists, are now available from Shambhala Publications. “Candragomin’s Twenty Verses on the Bodhisattva Vow” (with a commentary by Dragpa Gyaltsen), translated by Mark Tatz (Dharamsala: Library of Tibetan Works and Archives, 1982).